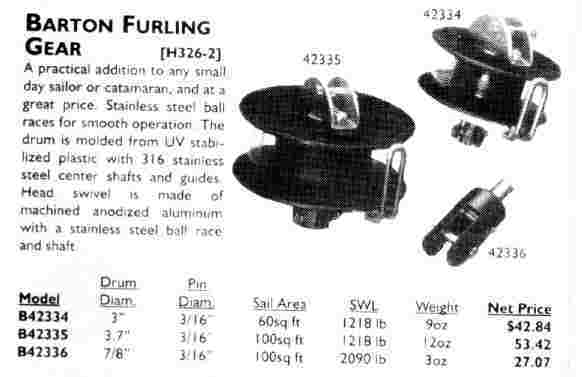 As a river sailer who enjoys "potting" about on the Potomac, I have always felt that the CDI furlers are a bit of over kill for an 18 foot boat like the Potter. My midwestern Lutheran upbringing just won't allow me to spend that much money on such a frivolous gadget. Before I bought the GraceII I had a Siren which had a small plastic roller furler that worked very well and didn't require significant sail modifications aside from having to bind the sail to the wire luff. Somebody on the Potter list pointed out the Barton furler in the Defender catalog and I finally decided to buy one to play with. I received the parts yesterday and decided to post this temporary web page in case anybody might be interested in the details. The Barton Furler has, in my very limited opinion, a number of advantages. The photos below show the Barton Furler and swivel/rotary. The Barton unit is similar to the low cost Harkin units that are available in most of the major catalogs like Boats US (p 258). The Harkin units (below) are a bit more expensive, but probably also a bit more rugged. The Harkin drum is about $90 and the Swivel/rotary about $57. "There is nothing - absolutely nothing - half so much worth doing as simply messing about in boats. In or out of 'em, it doesn't matter. Nothing seems really to matter, that's the charm of it. Whether you get away, or whether you don't; whether you arrive at your destination or whether you reach somewhere else, or whether you never get anywhere at all, you're always busy, and you never do anything in particular; and when you've done it there's always something else to do, and you can do it if you like, but you'd much better not." Disclaimer: I have no financial connection to Barton or their US distributor. I just think this is a neat item.